“I arrived in Canada in May 2016 and first met Kelly McGahey in October of the same year,” says Diane Tuyishime, a newcomer from Burundi. We were matched through the Ottawa Community Immigrant Services Organization (OCISO) career mentoring program. “What I value the most about our relationship, is the respect and trust she has shown me,” says Diane. “She has respected my decisions all the way and provided her opinion only when I asked for it. I have, at times, made decisions that I knew she wouldn’t strongly recommend. Even then, she valued my perspective and trusted that I was the one to make the call. Kelly recently invited Diane to deliver a speech at a HIO event in front of more than 100 people, which was a little intimidating for Diane. “Kelly believed I was able to do it, even when I was not so sure myself,” explains Diane. “For that and for all the hundred little things we have shared, Kelly is my ambassador of welcome in Ottawa,” concludes Diane. 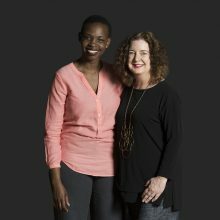 When Diane found a job, their formal mentorship relationship came to an end, but they have remained good friends, often sharing chats and lunches together.